The story of USM is almost similar to the history of Balance Of Power. Singer and bassist Tony Ritchie and drummer Lionel Hicks were part of the first line-up of Balance Of Power and also guitarist Pete Southern is part of the band since 1997. Tony did the vocals on the Balance Of Power-debut When The World Falls Down and afterwards featured as the sixth band member writing most of the songs for the band, although the American Lance King took over the vocals in Balance Of Power. 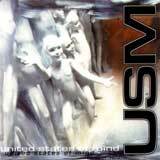 USM (United State Of Mind) was an idea Tony and drummer Lionel had for a while and finally managed to realize. Full of melodies "à la" Balance Of Power (logical after all), this Silver Step Child surprises with heavy, grooving tracks and they have their own trademarks. Heavy tracks like Beneath The Low or Terrorphobiac are really different from what Balance Of Power is using to do. On the other hands, Believe It Or Not or It's All Over Now are perfect melodic rock tracks "à la" Pink Cream or Balance Of Power. Tony Ritchies's vocals are good, variable. The mix has been done by Dennis Ward (Pink Cream 69) who stands for a great rock-sound. When I have received this promo I said to myself "here comes another side-project, another B-side songs". Not at all, USM has its own sound and identity and will please all melodic hard rock fans out there. I am sure!